Agatha Christie is an author whose work I've never felt inclined to read before. So, when I was offered the chance to dive into the latest Hercule Poirot Mystery by acclaimed author, Sophie Hannah, I jumped at the chance. I know it doesn't count as reading Christie, but I figured it would be a good way to meet the famous mustachioed Belgian detective that everyone seems to rave about. Plus, I just love the idea of an author paying homage to another author in this manner - its rather exciting. 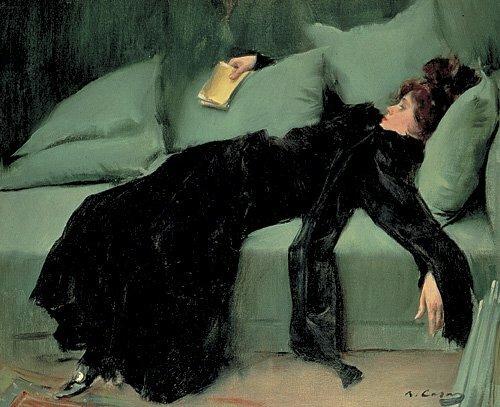 It reminds me of how thrilled I was when I heard that Sebastian Faulks would be penning a new Jeeves story last year - as a fan of Wodehouse, I was eager to read more Jeeves. 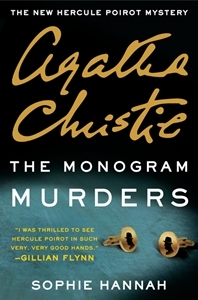 The Monogram Murders finds Hercule Poirot on vacation in London, or actually in hiding. He's trying to relax and remain incognito - he wants to give his tiny grey cells a break. Of course, murder and intrigue never take a break and Poirot manages to find himself involved in a new case - a triple murder at the posh, Bloxham Hotel. His friend Catchpool is in charge of the investigation and relies heavily on Poirot for guidance in solving this mysterious case. There are red herrings, secrets, misconstrued statements, monogrammed cufflinks, a famous artist, and so much more to deal with during this triple turned quadruple murder investigation and Hannah manages to keep you guessing all the way through. I loved Poirot and his obsession with making sure things were in order - from cutlery to bookshelves - along with his mustache and proclivity to suss out the truth. He was adamant about letting Catchpool figure things out for himself, which only added to Catchpool's frustrations when he couldn't. In fact, there were many a times that I couldn't help but wonder why Catchpool was even a member of Scotland Yard - he just didn't seem able to handle the job. As for Poirot, he's the type of man you would definitely want on the case. This story had me chuckling, gasping in shock, and reading until the wee hours - I couldn't help myself! I loved getting to know Poirot and reading about him solving a crime - it was fascinating. He picked up on things that no one else would even think to notice - his attention to detail was fantastic. And, I really did admire the way he believed in Catchpool - he was a true friend and mentor. Poirot is most definitely a character I would love to read again and again. I plan on reading Christie's books about this wonderfully charming character in the future and look forward to getting to know him through her own words. I do think Hannah did a superb job in creating a rich, detailed story that was engaging, mysterious, and utterly enjoyable to read. I would definitely read her work as well. It sounds like Hannah did a great job continuing Christie's character. I love Poirot so I'm glad to see another adventure featuring him! I'm glad you enjoyed your first exposure to Mr. Poirot. Thanks for being a part of the tour! I've been so excited for the release of The Monogram Murders and am so glad you enjoyed it! Particularly coming from someone who hadn't a previous knowledge of Poirot or Christie's style, it's good to know Hannah wrote an enthralling tale that entices people to now read Christie.